Editor’s Note: Around $500 was collected last Sunday, August 26, 2012 to accomplish a lay initiative to give backpacks to disadvantaged school children nearby the Seaford Area. For a small church, this is a great accomplishment for such a short notice and almost an impromptu project. I heard on the news last night that “there are over 1,000 active hate groups in the United States.” Over 1,000 active hate groups in a country that was founded on Judeo-Christian principles!” I wondered how many active love groups there are. I suggested. That's a start. 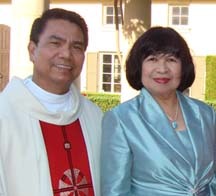 In his sermon this morning, Father Vergara spoke of the importance of family. We in this parish are indeed a family. But we are also family to every other human being on earth. Family members help one another in time of need. May we demonstrate that through this simple act of loving service. Words cannot describe how deeply grateful we are for your friendship and love. When we first came to this church some four years ago, we hardly know anyone of you. But now, we feel that we know all of you. We are intimately connected as family. We leave today to venture to a new church and take on a new challenge but we hold you close to our hearts and lift you up for God’s continued guidance and care. You are a spiritual beckon in Seaford, shining your light to the community. “Parting is such sweet sorrow,” as Shakespeare wrote. But we leave also with joy, knowing that you have become a more mature, more united and more empowered people. 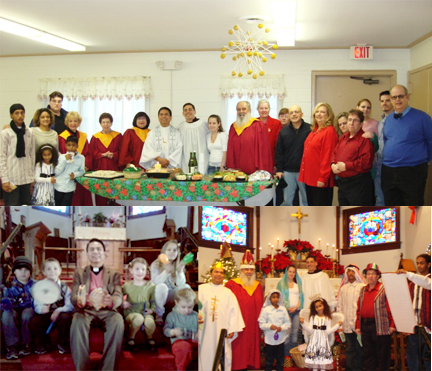 We may still see each other whether it be in the Diocese of Long Island, at St. James Church in Elmhurst (which is our next parish) or here in Seaford for some special events. But we wish to let you know that you remain our BFF---best friends forever. We are a Welcoming Church. We welcome the old and the young, the parents and children, friends and acquaintances, visitors and strangers, people in all sorts and conditions. In our church, “there is no outcast.” Check out the testimonies. @ St. Michael’s. Check out our events. We are a Neighborhood Church. For those living in Seaford, we are near the Seaford Library, near the intersection of Jackson Avenue and Merrick Road. There are parking spaces on church ground as well as public parking near the Library. We are a Historic Church. You will see our church bell, with the date 1897. Of course, the church was founded before that. The first service was in a shed in August 18, 1889 organized by three single ladies: Maria, Henrietta and Sarah. Check out our history. We are a Teaching Church. 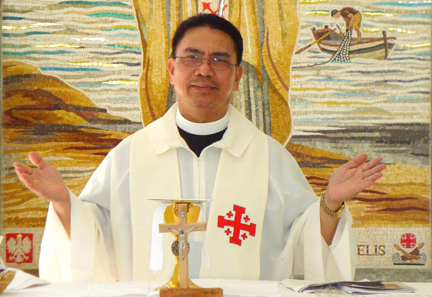 Our priest preaches a simple and practical sermon. We believe the Bible is “God’s love letter to God’s People” and so the message must be readable, understandable and adaptable to our lives. Check out the sermons at http.//stmichaelseaford.blogspot.com. We have Advent and Lenten Seminars that relate to spirituality, mission, stewardship and ministry. We are a Caring Church. Our priest or our trained Lay Eucharistic Visitors visit the sick and shut-ins to give the Blessed Holy Communion. We pray for healing of the sick and all forms of blessing (birthday, house blessing, car blessing, etc.). There is Catholic Charities and AA groups that use our Hall. We are a Social Networking Church. 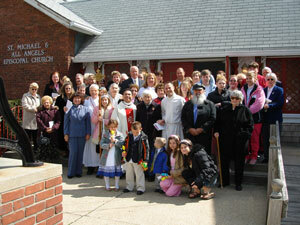 Find us in Facebook.com/stmichaelschurch.seaford. We are an empowering Church. New members, seeing a need want to make a difference. “I am a frustrated singer, I want to sing.” Join our Choir. “I am a former plumber, I want to fix the sink.” Please go ahead. We emphasize asset-building and positive thinking. We are a Church on the Way. One person commented we are a “Gas Station Church.” People on their journey stop by our church, get the “in-filling of the Holy Spirit,” and move on with their journey. We are a Missional Church. The heartbeat of our church, in the words of our Presiding Bishop, the Most Rev. Katharine Jefferts Schori, is “mission, mission, mission.” Both in the City of Seaford and in other parts of the world, we do what we can, to serve Christ’s mission. Lindsay and Heather have been members of our church since they were eight years old, and both of their parents are very active volunteers, as well as being Vestry members. 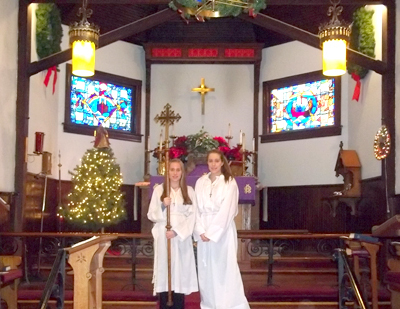 They are former Sunday School attendees who chose to become Acolytes for St. Michael & All Angels in order to follow in their older sister's footsteps, whom is now away in college. 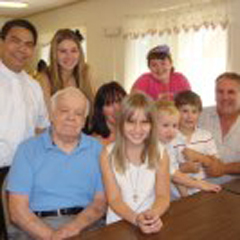 They wanted to be able to make a contribution to the church and to help Father Fred in celebrating the Eucharist. Lindsay said "she loves our church because it's small enough to get to know everyone, everyone is nice, and she feels closer to God when she's there". Heather too likes the intimacy of the church and all of the members knowing each other in a very friendly way. She said "she can feel God's presence during services each Sunday, and feel's comfort in that". Lindsay and Heather always pitch-in during church family events as well, such as during our Chinese Auction and Night At The Races. Also, they recently represented the parish as Youth Delegates during the "Diocesan Convention." We look forward to there ideas in how to make our church a fun place for many teenagers and young adults, as the St Michael's for Teens events will expand this year! YOU ARE INVITED TO ST. MIKE’S CHOIR!